Rogues on Parade in New 'Gotham' Teaser "Villains Rising"
It's a rogues gallery party in the latest Gotham season 2 teaser aptly entitled "Villains Rising." Despite Jim Gordon (Ben McKenzie) and Captain Essen (Zabryna Guevara) declaring it a "new day" in Gotham, it sure looks like the inmates are running the asylum both figuratively and literally. The montage includes glimpses of every villain and rising villain ready to fill the power vacuum left behind by the events of last season. Billionaire Theo Galvan (James Frain) appears to be assembling his own crew of baddies including his sister Tabitha/Tigress (Jessica Lucas). 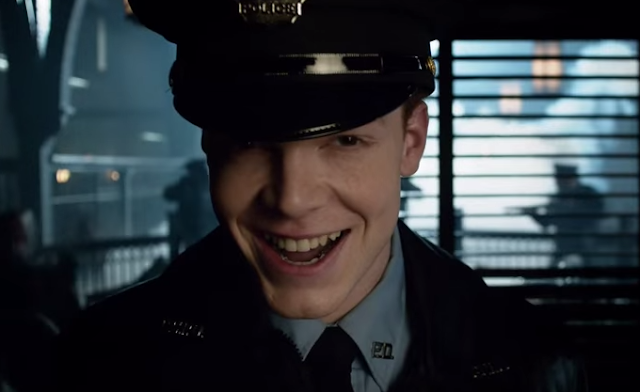 Rogues on parade include Oswald Cobblepot, Victor Zaasz, Edward Nygma, and the recurrence of one Jerome Valeska (Cameron Monaghan) who certainly has the Joker laugh down. Gotham returns to Fox for season 2 beginning Sept. 21.